Jackie, like her mother, likes to peruse the large waterfall racks of tourist brochures to see what there is to see. She painstakingly pores over the whole rack and chooses a few select brochures that interest her and usually comes away with at least one that no one else noticed. She then proceeds to memorize the brochure and recite all the pertinent details about the place as often as she deems necessary. 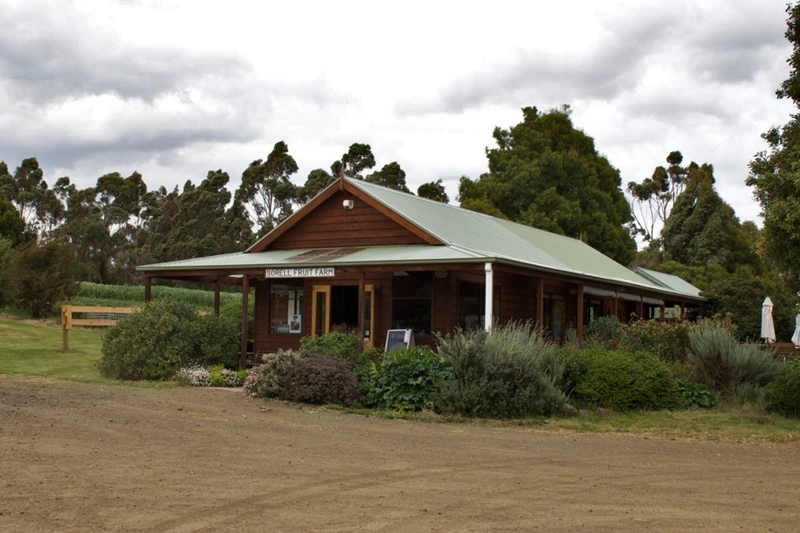 The night before, she'd picked up brochure for the Sorell Fruit Farm, which was alluring because visitors were allowed to pick their own fruit right off the plants. All you needed to do was buy a punnet. The farm was only half an hour away from Hobart and on the road to Port Arthur (our big destination for the day), so we added it to the agenda. We pulled up to a cute little building in front of a vast field filled with rows of flowering trees and ground plants. We went inside and the woman at the front counter told us that it was the beginning of the season so there wasn't much to pick—only a few strawberries. 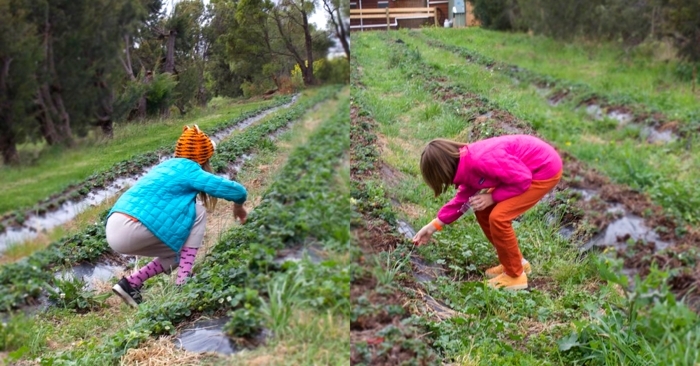 That was just fine with the girls, so we got a few punnets and commenced to picking. We ended up getting three full punnets of strawberries that kept the girls nourished for the next few days (we're on a budget here people). We also strolled through the apple and cherry orchards, both of which were in full bloom. The girls even made the Sorell Farm Facebook page. 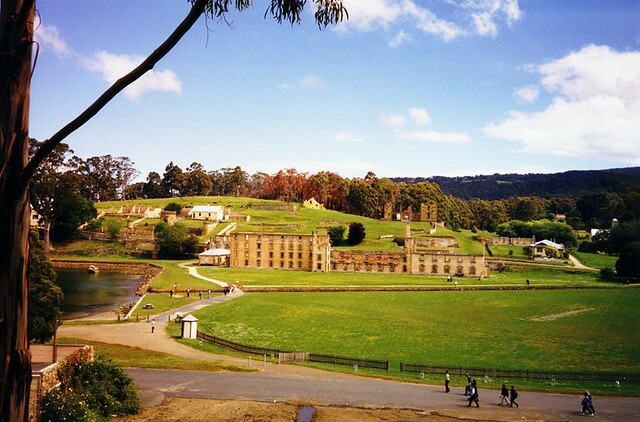 Then it was off to Port Arthur (a UNESCO World Heritage Site), another hour to the south. Port Arthur was a second-offense penal colony (meaning when you screwed up at some other penal colony you got shipped off to Port Arthur) that operated from 1833 to 1877. It was notable because it was located on a peninsula on the southern end of Tasmania. There were no fences or walls surrounding the grounds; the only way in or out was by boat or across Eaglehawk Neck, a 30-meter-wide isthmus that connects the peninsula to the rest of Tasmania. Back in the day, this area was patrolled by dogs and armed human guards, which made escape challenging. Samantha and I had spent some time here on our honeymoon 15 years prior, and we'd told the gals some tales about the visit over the years, so they really wanted to see it. But on this visit, the main building was under repair. It had been damaged by salt water during a particularly energetic winter storm a few years ago, and they were reinforcing it. This sort of dampened the photographic allure of the grounds. Other than that, the rest of the place was pretty much like it was 15 years ago. We first toured the bay on the free boat, going past the Isle of the Dead (where many convicts were buried), then checked out a few of the buildings, like the Commandant's House, before we headed back to the visitor center for the free walking tour at 4:30 p.m.
As we met our guide, it started to rain, so we didn't walk around as much as we would have in a less damp situation, but she told us a lot about the history of the place (her father was a ranger here, and she'd grown up near the grounds), talked about what the life of a convict was like, and told us some tales about prisoners who'd escaped or tried to escape. Her favorite, was the story of Billy. Billy ended up at Port Arthur because he was lazy. 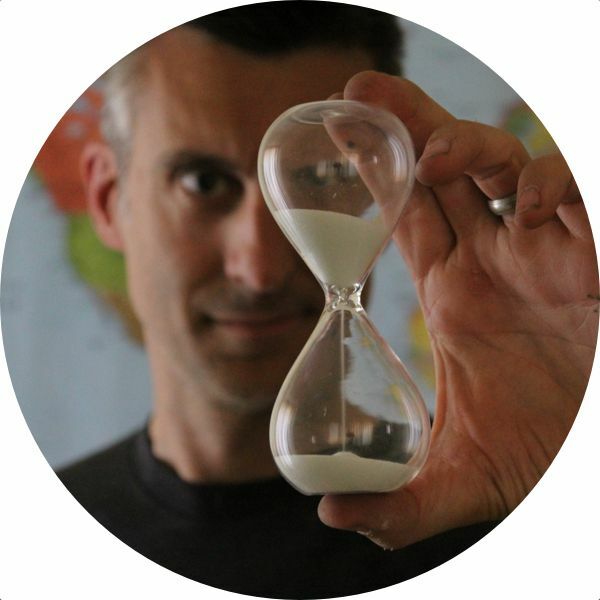 He started out as a convict in Hobart, where he was always looking for ways to get out of work. It seems he pushed things too far, because he was sent to Port Arthur to serve out a term of hard labor. One night, though, he managed to escape. He made his way up to Eaglehawk Neck and was trying to figure out how to get past the dogs—if he could do that, the human guards wouldn't even know he was there. He's stumbling along in the dark, trying to be stealthy, when he trips across a dead kangaroo. Being a thinking sort of fellow, skinned it (with what it's not clear), put the skin on over his body, and started hopping across the isthmus like, you know, a kangaroo. The dogs, of course, set to barking. This in turn alerted the guards, who came running, ready to bag an escaping prisoner. But all they saw was a large kangaroo hopping along. Nothing to worry about ... until one of the guards decided a meal of fresh kangaroo would be a tasty supplement to their rations and started shooting. Billy didn't want to get shot, so he raised his hands and said, "Don't shoot! It's me! Billy!" (I don't know if he really said that, but that's how the story went). The guards, after they stopped laughing, clapped him in shackles and sent him back to Port Arthur with a note pinned to his clothes that read, "Don't be too hard on him. He gave us quite a bit of entertainment." He only got 50 lashes (instead of the normal 100 for escape attempts). 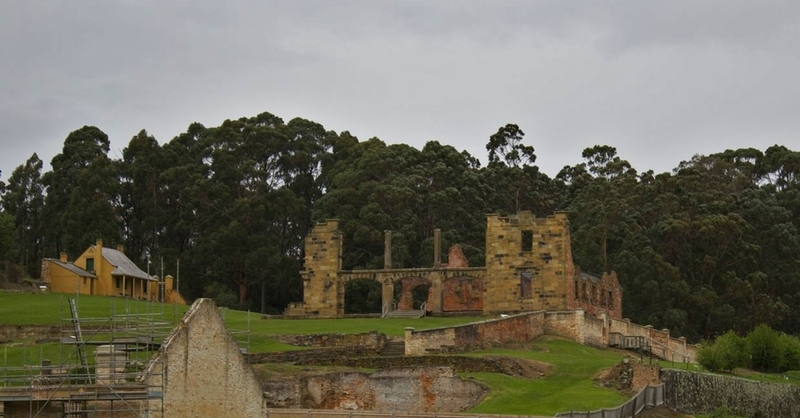 The remains of the Port Arthur prison hospital. You didn't want to get sent here. After the tour was over, we walked around for a little bit, but the rain started coming down with more vigor, so we escaped to the dry confines of our car. The entrance fee to the park is good for two days, and we thought about going back the next day to see some of things we missed because of the rain. But, after driving for a little while (on the left side of the road, in the dark, on wet, narrow roads) on our way to the Wind Song B&B, some two hours to the north, we decided we didn't want to go all the way back to Port Arthur the next morning. As we got closer to our destination, we were a little nervous about finding the turn off to the B&B. Some people reported it was hard to find, and Google Maps didn't know how to get there (it had us driving 30 minutes further north, doing a U-turn, and driving 30 minutes south back along the same route). As it turns out, though, there was a big, blue-and-yellow sign that said "Wind Song B & B" right on the Tasman Highway, so I'm not sure why some people had trouble finding the place. Maybe the sign was new. As we drove along the dirt road in the dark, a good number of wallabies bounced along all around us: next to the car, behind the car, and, of most concern, in front of the car. The girls were delighted to see these cute, bouncing balls of fur. After we negotiated our way past a locked gate, we arrived at Wind Song, a delightful little B&B well off the beaten path. We checked in with our hosts, got settled in, and soon enough, drifted off to sleep.